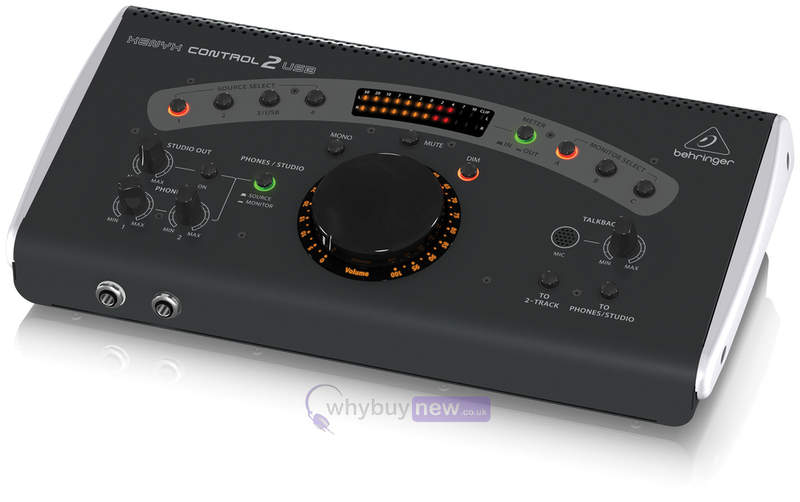 The Behringer Xenyx Control 2 USB is a studio control and communication center which gives you direct access to all-in-one master volume, talback, source selection and monitor control without having to run cables. The 3 adjstable monitor outputs allow you to connect up to three sets of monitors, allowing for a variety of combinations. This means that fine-tuning your mix to suit all listening environments is easier than ever. Also featured is a large volume knob with high-end Voltage Controlled Amplifier technology, enabling precise adjustments for optimum accuracy, and the built-in Talkback box allows you to directly communicate with the artists. When its time to get down to the business of recording or mixing, the last thing youll want to do is crawl under your desk and run cables. The ultra-handy Control 2 USB gets you off your knees, putting Master Volume, Talkback, Source selection and Monitor control right at your fingertips. Now you can choose from up to 3 sets of active studio monitors and 4 different stereo input sources to create powerful, custom monitor mixes. Plus the built-in Talkback mic lets you communicate directly with the talent. The incredibly-versatile Control 2 USB makes you the master of your domain! Small knobs lack precision but the bigger the knob, the better the level of precision. Think of a control knob as a circle. On a small circle/knob the distance from one degree to the next is very small, making it challenging to dial-in perfection. On our really big knob, the distance between the degrees of the circle is much larger, allowing you to make minute adjustments with ease. 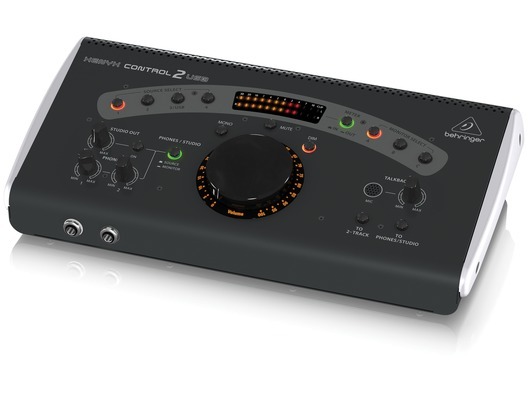 Control 2 USB lets you set levels fast and accurately, which can be critical to the final sound when it comes to mastering an important project. Unlike the typical and inexpensive resistive faders used by our competitors, the Control 2 USB utilizes high-end Voltage Controlled Amplifier (VCA) technology to provide the ultimate in precision level adjustment. And while conventional faders directly control how much of the signal passes through to the amplifier, our bigger knob actually controls the voltage that drives the amplifier, for output that remains absolutely faithful to the source. The high-quality, built-in USB audio interface lets you connect directly to your computer and its digital library, creating the ultimate sound source control center with no additional hardware or drivers required. In the golden age of recording, engineers had to make the mix sound great in just two places, the studio and the car. When you consider the acoustic environments and the equipment used in each, its not as easy as it sounds. Todays computer-based recordings have to sound great in even more situations, such as MP3 players, podcasts and other bass-challenged systems so experiencing your mix through as many speaker systems as possible is more essential than ever. The ultra-convenient Control 2 USB lets you switch between up to 3 pairs of studio monitors; add or remove a subwoofer; listen through vintage-style small monitors (such as our C5A or C50A), or any other combination at the mere press of a button! We gave the Control 2 USB enough connectivity to handle just about anything youre likely to plug in. Four stereo Inputs allow you to connect a CD player, MP3 player, computer/ DAW and even a turntable, thanks to the built-in high-end RIAA preamp. Plus you can connect keyboards, drum machines or anything else youd like to put through your monitors. 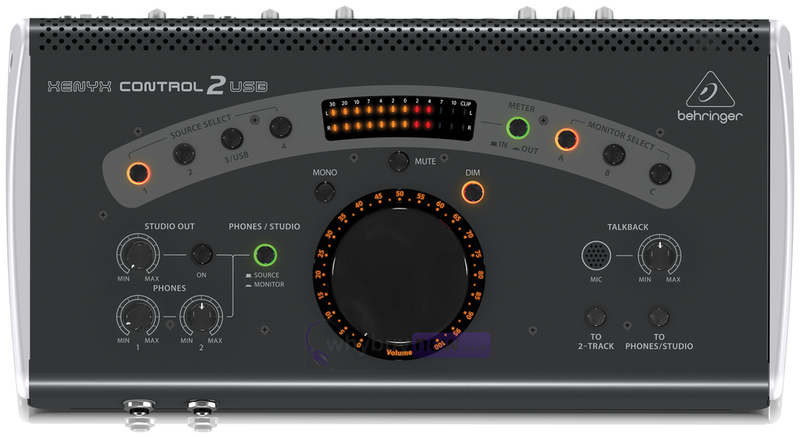 The rear panel of the Control 2 USB provides 3 separate Monitor Outputs with individual Level controls; a computer/DAW stereo Output; 2-Track A and B stereo Outs with Level switches; a Studio Out with Level and Phones Out with Level switch. Inputs include: Channels 1 & 2 stereo Source Inputs with independent Level controls; a computer/DAW Mix Input with Level control, with one selectable as a Phono Input for your turntable. Theres even a footswitch jack so you can activate the built-in Talkback mic, without taking your hands off the mix. You get all this I/O capability plus USB connectivity. No need for a desk stand and an external mic to talk to the talent in the isolation booth.Control 2 USB's high-quality, built-in microphone is just a button push away, so you can save your mics for the drum kit. The onboard headphone amplifier section lets you connect 2 pairs of headphones with individual level controls, which should make the next session one of your best. We designed the Control 2 USB to provide many years of super-clean, high-fidelity performance in the most critical listening environment yours! To that end we only use the finest components, connectors and state-of-the-art surface-mount manufacturing technology to build each one. We test, and then re-test every single Control 2 USB and back them up with one of the best warranty programs in the industry. Stop by your authorized Behringer dealer and spin the bigger knob on the sensational Control 2 USB, or place your order online today easy never sounded so good!